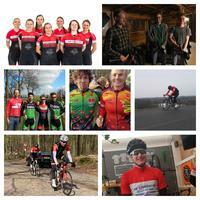 The Student Cycling Association, Tandje Hoger, was founded on the 17th of January 1977. 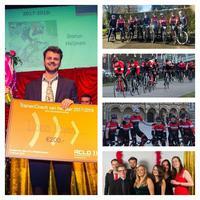 With more than a hundred active members, many donors and several honorary members, it is one of the largest student cycling associations of the Netherlands. Whether you are a true racer or more of a tour rider, at Tandje Hoger we support both forms of cycling. Many of our riders participate in races throughout the country and we offer serious training to develop yourself as a better cyclist. For the tour rider, we offer lower intensity training, organized rides, we join tour-events and even go to Spain, once a year. However, being a student organization we offer these activities in a relaxed environment. We organize social events, like the bi-weekly drinks and monthly not-cycling related activities and many more. Fill out the form and follow all steps. Your data will be sent to Tandje Hoger, after which you will receive a confirmation e-mail. For an elaboration on the collection of data, read our privacy statement. Required fields have to be filled in to be registered as a member. Adress details and bankaccount details are used to fulfill the registration and contact the member. Members do not have to fill in the non-required fields for the purpose of registraton. The fields serve other purposes, like improving communication between board and member or members amongst each other. Language is an optional field, with Dutch and English as the possible entries. It allows the board to contact international students separately, when appropriate. By filling out the non-required fields, the (new) membber will permit the saving of data and use for the purposes are described in the privacy statement. A member has the ability to hide individual data in the member-area of the website. The board can access the data, also when its hidden. TH-Mail: Every month, a newsletter is send to members and donors. To send the mail, Tandje Hoger uses the services of MailChimp. To send these mails, we share the names and e-mail of the member and donor with this service. For the purpose of analyses, MailChimp adds a tracking-pixel to the e-mail. Complete informatie can be found in the cookie-statement by Mailchimp. Tandje Hoger only uses this data to improve the TH-mail experience. You are now a candidate-member at Tandje Hoger. The next step is to download the SEPA-form. A translation of this form will be included in the initial mail after signing up. Be aware this is NOT an official form. You are required to sign the Dutch SEPA form. You should print this form and sign it. With this form, you authorize Tandje Hoger to withdraw the yearly contribution. Send the form within 2 weeks to Tandje Hoger to finish your registration. If you fail to do this, your registration will be canceled. You can choose to send the form to the address, which is written on the form or mail the form to the secretary. If you choose to send the form through email, make a proper scan or use an app like 'adobe scan' and make sure it's fully readable. If the readability is not sufficient, the secretary can ask you to send it again. Go to the ACLO-website and activate your college card. You are welcome at the next training. It is not necessary to wait for the confirmation e-mail. There is a deadline for membership termination at G.S.W.V. Tandje Hoger. For 2018 this deadline is set at the 25th of November 2018. Missing this deadline means your membership will be extended with another year. In case of unsubscribing after the deadline, the membership will be terminated on the 31 of December, the following year. Important: If you are a KNWU or NTFU member through Tandje Hoger, tell us in the email. Almost every month, Tandje Hoger goes out for a tour ride, organized by the tour committee. The rides are usually around 70 kilometers and include a break for coffeee and pie. Together with the race commissioner, the committee organizes the 'Dropkoersjes' during the pre- and after season, the summer competition, TH-time trials and many more. Aside from riding our bikes, we enjoy other activities as well. The 'borrel' committee organizes drinks and other social activities. The board can ask this select group of individuals for advice. It consists of old board members from Tandje Hoger. Tasked with checking the work by the treasurer and consists of old club-treasurers. The editors have their eyes and ears open and absorb every gossip and four times a year they write everything down for the club magazine. In 2018, Tandje Hoger will once again have a pr-committee. Aside from general PR related activities, this committee focusses on the KEI-week, the introduction week for new students in Groningen. 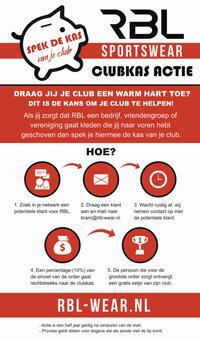 Members can order their club clothing through a webshop (rbl-wear.nl). Before you can register, you need a keyword. Send an email to pr@tandjehoger.com to acquire it, or ask one of the board members when you see them during one of the activities. Are there any obligations, tied to a membership at G.S.W.V. Tandje Hoger? There are two: Paying the yearly contribution (26 euro) and having an ACLO-card. Read more below the ACLO heading. There are no additional obligations, like presence at training etc. 1. Is the use of a helmet required? Yes, absolutely! Also, gloves are highly recommended. 2. What are the training times, and where does it start? That depends on the time of year. The training times are on the calendar at the main page. Read more below the training header on this page, above. 3. Should I be afraid that I can't handle the intensity? No, the experience and level of riders are taken into account during the training. During intense efforts, the group is split based on level. During an endurance training, the tempo is adapted. Especially the Wednesday training is suitable for new riders, where the tempo is lower and there is an additional focus on technique. During other training, it may be the case that it's difficult, but with cycling, you can improve your basic fitness in just a few weeks of riding! 4. Do training always take place? The Tuesday in Wednesday will take place unless the weather doesn't allow it (for instance when it's slippery in the winter). If you want to cycle at other moments, you can use the facebook group to join or organize a ride. Can I participate in races at Tandje Hoger? Yes. More info is found at the race header on this page, above. How do I obtain a racing-license? info is found at the race header on this page, above. Are there additional requirements for competitive cyclists? No, but it's strongly encouraged to participate in the training on Tuesday and ride at Corpus on Thursday. This is however not obligatory. Only for team-time trials, there are requirements regarding training participation and level. There is generally no selection procedure, however, there is a team-sign up. This is taken care off on the forum. 1. Is there separate training for ladies? Tandje Hoger does not organize ladies-only events but highly encourages the ladies to ride together and organize ladies-only socials. As a club, we want everyone to be able to participate in the events that we organize. There is a dedicated WhatsApp group for the ladies, which is used to meet-up. We recommend all female members to become a member of this group. Ask one of the board members (if possible a female one), how to join this group. 2. Do woman participate in races? Yes, there are several women at TH that have a racing license or a basic-license. 1. How do I obtain a username and password for the website? To log in, you need to be a member of Tandje Hoger. Ask the board secretary (secretaris@tandjehoger.com) if you need help. 2. Can I use the username and password from the website to log in to the forum? No, you need to register separately for the forum. 3. What should I do when I forgot my password? If you forgot your password, you reset it, using the 'wachtwoord vergeten' function. 1. What is an ACLO card? As a member of Tandje Hoger, you need to activate your student card. Costs are 59,95 euro for each academic year. After activation, you can use the ACLO sports facilities and become a member of the different student sports associations. In 2019 it becomes possible to buy half-year cards and become a member of an association. 2. Can non-students purchase an ACLO sports license? This is possible under certain conditions. You can find more information about this on the ACLO website. 3. I want to become a member, but it's currently February/March/April/may/June/July/August. Should I still purchase an ACLO card? Yes, you need to have an ACLO card to become a member of Tandje Hoger. As said under 1., a midseason card is not sufficient (most likely till 2019). This is because of the training-subsidization from the ACLO. 4. I quit/finished my study, but I want to purchase an ACLO card, is that possible? If you finished your study you can purchase an ACLO sports license for three more years after graduation at an increased price. If you quit your study at the RUG or Hanze, you can purchase an ACLO sports license at an increased price level for another year. 5. I can't purchase an ACLO card anymore, but I want to become a member, is that possible? It's possible through a dispensation system. Associations like Tandje Hoger have the possibility to give out a limited amount of dispensation cards. It's up to the club-board to decide. Ask the board secretary if there are possibilities. If approved, you can purchase a sports license at an increased price. In general, this is reserved for people, whose membership would significantly contribute to Tande Hoger. 1. Are there obligations tied to donorship at GSWV Tandje Hoger? As a donor, you only need to pay the yearly contribution fee (26 euro). It's a great way for ex-members to maintain a connection with the club. 2. What are limitations for donors compared to full members? Donors can't participate in the spinning training during the winter or the Tuesday/Wednesday training in the summer. That's because the rental of the spinning-room and the trainers are subsidized by the ACLO. Voor any questions you can send an email to the secretary. 1. What is the bike insurance? As a member of TH, you can become a member of the NTFU at a discount. This membership, among other features, includes a bike insurance. 2. What are the advantages of becoming a member at NTFU and what are the terms and conditions? On this page, you can find more information and a link to the terms and conditions.On this page you can find more information and a link to the terms and conditions. Sadly, this information is only available in Dutch. If you have any questions, send an email to the TH-secretary. 1. How can I obtain club clothing? This is explained under the clothing header, above the FAQ. The website rbl-wear.nl functions just like any other webshop. Before you register an account, contact kleding@tandjehoger.com to obtain the registration key. 2. How do I get the products that I've ordered? At the check-out, you can choose between mail-delivery or club-location. Delivery is free above 70 euro. The club-location is always free and means you can collect your order at Spaak Groningen or RBL-wear at the outskirts of Groningen. 1. Are there CX-events at Tandje Hoger? Yes! After the roadseason, our members train and join CX-races. Ask race@tandjehoger.com for more information, keep an eye on the forum and the facebook page. 2. Are there any MTB riders at Tandje Hoger? Yes, but not many. They can train with the CX, but there is no MTB-specific training. TH'ers can join ATB-Noord at a small fee.